For orders of 10 or more books, please contact the publisher, Mamizu-Shuppan. Please read the book to understand deeply the intent of this proposal and avoid misunderstandings. Please click on the buttons above to see details. How can we overcome the critical deadlock situation faced by Japan and the world? The answer is here. With a concept from a completely new dimension, this book presents a definite road for Japan to gain new vitality and for the realization of world peace. What is the road to the resolution of global-scale environmental problems and to the realization of a world without wars and disputes? What is the true intent of the Peace Constitution of Japan? In this book, we will examine the essence of the constitutional revision issue in Japan and settle the issue. You will gain a comprehensive and essential understanding of our present circumstances with the global-scale environmental problems such as the problems of food and energy supply, nuclear energy, wars, disputes and terrorism, and the condition of Japan's educational system and youth. This is the road to linking our daily work and studies to the resolution of the critical situation of Japan and the world, the renewal of vitality in Japan, and world peace. This book presents a way of being for the country that encourages hope and motivation in living. In this book, a detailed and clear explanation of the issue of constitutional revision in Japan is presented from various angles to settle the issue of constitutional revision. A point that has commonly been overlooked is that the Constitution of Japan is "a proactive declaration of a ‘nation founded on peace' that transcends simply proclaiming unarmed neutrality or protecting the country through military force". This book explains convincingly the true meaning of the Preamble of the Peace Constitution, which declares, "for the preservation of peace, and the elimination of tyranny and slavery, oppression and intolerance for all time from the earth", and so that all peoples of the world can live in peace, free from fear and poverty, by taking the lead and exerting every possible effort to contribute, we desire to become a necessary and vital entity and occupy an honored place in the international society. Article 9 is supported by the declaration in the Preamble of striving to establish the nation on peace without military force. In other words, the true intent of Article 9 becomes clear only when the Preamble and Article 9 are taken as a set. Therefore, "renunciation of war" of Article 9, Paragraph 1 means renunciation of all warfare including "war for self-defense". It is also clearly explained that "abolishment of military (demilitarization)" of Paragraph 2 is a declaration of renouncing "armaments for self-defense". Furthermore, this book clearly demonstrates that it is fully possible to establish a nation on peace following in line with the Peace Constitution, by examining examples of countries, such as Switzerland, which have a permanent neutrality policy, and Costa Rica's pacifist policies based on its peace constitution. In addition, a new unprecedented proposal, which makes the spirit of the Peace Constitution tangible in a proactive and effective form, is outlined to resolve the many serious problems faced by Japan and the world. Most of the debates on the issue of constitutional revision focus only on "How can we protect Japan?" When considering the Constitution of Japan, it is vital to focus not only on Japan, but to have a perspective on how we and Japan should act in the midst of the critical deadlock situation facing the world. To make the correct decision regarding the issue of constitutional revision, for the resolution of the many problems of Japan and the world, and to open up a new future, it is necessary to understand fully the background of the circumstances in which we now stand and the critical situation faced by Japan and the world. Drawing upon various resource materials, this book explains about the global-scale environmental problems, the problems of food shortage, energy supply, nuclear power, wars, disputes, and terrorism, and the condition of Japan's educational system and youth, so that with this one book, the reader can gain a comprehensive understanding of our present circumstances. The condition of human society, including the environmental problems, is extremely grave, far beyond our power of imagination. Furthermore, the Japanese society is facing a deadlock situation in various aspects. In addition, now, the actual situation is that Japan is about to take a large step on the road to war again by revising the Constitution, and the outlook of the Japanese society is extremely dark. From within the flow of Japan's history and the many serious problems created by humanity, it is impossible to change the flow and find a resolution. Due to these problems, Japan and the world are facing a critical deadlock situation. To resolve this critical situation, it is important to find the fundamental cause of the deadlock, and create a completely new flow to remove the cause. Through macroscopic analysis of the actual situation of society and with a historical perspective, this book presents a convincing explanation that the fundamental causes of the problems are not separate, but that there is one fundamental cause -- that is, the way of thinking, "as long as it is in my own nation's best interests", which is the confrontational stance among nations based on "national egoism". We cannot fundamentally resolve the serious problems of Japan and the world through only symptomatic treatment measures. It is vital to clarify the fundamental cause and take fundamental treatment measures to remove the cause. It is impossible to eliminate the confrontations among nations due to national egoism, which is the fundamental cause of the deadlock situation, through conventional means such as discussions among nations, or preaching, "Let us stop national egoism", "anti-national-egoism", "Let all the people of the world get along together", or "Let us create a world federation." This is clear by looking at the history up to the present. To eliminate the confrontations among nations due to national egoism, Japan should take the lead and renounce national egoism of its own volition. In other words, it is necessary to transition from an "egoistic nation" to a "non-egoistic nation". A "non-egoistic nation" means instead of being a nation that says, "as long as it is in my own nation's best interests", become a nation that takes actions considering other nations in the same way as one's own nation. The present human society is facing a critical situation due to factors such as global-scale environmental destruction, wars and terrorism. However, although partial resolutions or improvements have been achieved through the efforts of many people, effective measures toward a fundamental resolution still have not been found. To overcome this unprecedented crisis in the history of humankind, it is imperative, first, to ascertain the fundamental cause of the crisis situation of human society, and then to eliminate the cause, adopt new ways of thinking and take concrete actions on a completely different dimension from the various conventional activities. 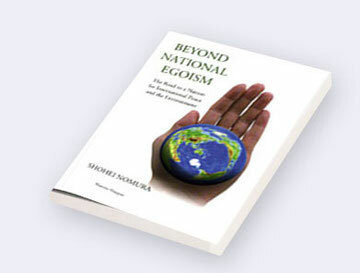 I published the Japanese edition of “Beyond National Egoism─The Road to a Nation for International Peace and the Environment”. In this book, the fundamental cause of the crisis faced by human society is clarified. Then, to eliminate the cause, a proposal is presented regarding "What we can do from the Japanese standpoint to effectively utilize the unique characteristics of the country of Japan". The key is the present Constitution of Japan that is based on the spirit of establishing the nation on peace. However, the reality is that it cannot be said that a surprisingly large number of Japanese understand well the spirit of establishing the nation on peace as written in the present Constitution of Japan. In fact, in Japan, with the government playing a central role, the movement to revise the Peace Constitution and make Japan "a country that can engage in war" is ever-increasing. This is a critical situation for Japan and the people of Japan. In contrast, regardless of whether they are people of Japan or another country, people who learn about and deeply understand the spirit of establishing the country on peace as written in the Constitution of Japan often say, "The Constitution of Japan is a treasure of humanity".To lose this Peace Constitution by constitutional revision would be an irrevocable loss not only for Japan, but for the human society. The Japanese edition of the book gives an easily comprehensible explanation so that as many people as possible in Japan can learn about the spirit of establishing the nation on peace as written in the Constitution of Japan and its historical significance. At the same time, a proposal is outlined to overcome the unprecedented crisis faced by human society, and in addition, to give Japan new life. The proposal is to aspire to create a new nation by actively and effectively utilizing the revolutionary spirit of establishing the nation on peace as written in the present Constitution of Japan, which ought to be called a treasure of humanity. Specifically, it is "to raise a new ideal in Japan to aspire to become a nation for international peace and the environment". The Japanese edition of the book was written for the Japanese audience. Therefore, including the issue of constitutional revision, the various situations in the Japanese society and what the Japanese people should do are discussed in-depth. In this English edition, with the exception of a portion, the main parts of the book are presented, including the preface from the Japanese edition. Although the contents were directed toward the Japanese audience, I feel the fundamental issues and ideas are universal and will resonate with and gain the understanding of the many concerned people throughout the world. In addition, a new proposal is presented from the viewpoint of "What we can do as world citizens to fundamentally resolve this critical situation faced by humanity." I anticipate that by reading this book, around the world, more and more people will emerge who in their daily lives and activities find new hope and motivation in living by realizing that here is the definite path to overcoming the present crisis faced by human society and discovering the bright light of the future of human society. With the issue of revising the Constitution, Japan now literally is standing at an important crossroad that will influence the future of the country and its citizens. Divided into two sides - "Revise the Constitution" or "Protect the Constitution" - the Constitution is being actively debated, but the opinions of both sides do not adequately mesh. Not just for us who are living now, but for our children and grandchildren, we must take time to discuss the matter thoroughly to the utmost of our ability and not make a mistake in our decision. I feel there are two main problems in the debate on the Constitution. First, discussions are proceeding without a thorough understanding of the true meaning of the existing Constitution of Japan. Consequently, the discussions are at a superficial level. In this book, we will read the Constitution anew in a straightforward manner, and gain a clear understanding of its true meaning. In order for each one of us to make a decision for ourselves about the issue of revising the Constitution, I have presented my thoughts using the most up-to-date facts and examples. Second, most of the debate focuses only on "How can we protect Japan?" The present situation that human society is directly facing a crisis, bearing various serious problems such as environmental destruction, has not been in consideration. Most important is to consider and focus on what Japan can do so that humanity can overcome this crisis, and not focus only on protecting Japan. This book presents a proposal that will settle the controversy on constitutional revision, giving a comprehensive view that has been overlooked in the past debate on the Constitution. As many international organizations and scientists have warned, the world, including Japan, now is facing a crisis situation in various facets. Further, the actual situation is far more urgent than generally thought. Various problems such as global-scale environmental destruction, food supply shortage, water shortage, poverty and medical problems in developing countries, energy and nuclear energy problems, conflicts, war, and terrorism have brought about this situation. We who live in Japan are closely tied to these serious problems. Looking within Japan, we have many societal problems such as the constitutional revision issue, unclear future for the economic situation, environmental and energy problems in which we are late in taking measures, educational problems which we cannot see how to resolve, such as bullying in schools, absenteeism, and classroom disruption, and the increase in young people who feel apathetic, have lost hope, and lost sight of a purpose in life. So, here in this book, using many reference materials and data, explanations are given such that the reader can understand comprehensively and essentially the present situation of Japan and the world. In addition, the history of how human society, countries, and the structure of the world were formed will be reviewed to find the root cause of why society has come to this critical state. Deeply concerned about this serious crisis situation, governments, organizations and groups from various countries and a great number of caring people have been making efforts steadily in various ways to break out of this situation. Through these efforts, many problems have been improved. However, in terms of an overall and fundamental resolution, it cannot be said that a solution is in sight. What does this indicate? It means that the critical situation that Japanese society faces and the crisis that humanity faces did not arise by chance and not automatically. In the history of humanity and Japan, there must be an inevitable and fundamental underlying cause. As long as this cause is not understood, we cannot change the course of history that is rushing headlong toward destruction. To fundamentally resolve the situation, we must grasp and overcome the destructive cause that is lurking in the undercurrent of history. In this book, a measure for resolving the problem at a fundamental level is proposed. This measure arose through the process of investigating our inherent "way of being" - each of us individual human beings, and the country of Japan. This is an unprecedented new way of thinking. So, please keep an open mind and read this book without being bound by preconceptions, stereotypes or fixed ideas. By doing so, you will be able to understand how this is a sufficiently feasible proposal supported on a realistic foundation. Further, you will realize that the key to resolve the crisis facing humanity and the critical situation of the Japanese society is in fact, in your own hand, and in the hands of each one of us. Chapter 1 Can We Protect the Peace Without Military Force? 2. Is Non-Military Neutrality Possible in Today's World? The First Ever in History "Peace Nation That Renounces National Egoism"
A Nation of Peace or a Nation of Military Force? What Is the Shape of the Nation for Which We Should Aspire? Aspiring to Become a "Nation for International Peace and the Environment"
Japan-U.S. Security Treaty or the Peace Constitution? 2. What Country Will Attack Us? Possibility of Attack from North Korea? Possibility of Attack from China? Revise the Constitution and Become a Nation That Can Wage War? The Key to the Revision Is the "Preamble" and "Article 9"
"Exercise of the Right to Collective Self-Defense" - Is It Permissible? What Will Become of the Military Draft? Will Military Force Truly Be a Deterrent? What Is Military Force for Self-Defense? Can There Be a War for Justice? What Is the Originality of the Peace Constitution? "Article 9 Is a Gift to Humanity"
"Renunciation of War Is a Model toward Which All Nations Should Strive"
"Article 9 Society" Formed in the U.S.
Human Society Is Maintained by the "Power of Peace"
2 Can Global Warming Be Stopped? Can CO2 Emissions Be Reduced? 3. What Is the Actual State of Ozone Layer Depletion? III. How Can We Overcome This Crisis? Chapter 1 What Is the Fundamental Cause of the Crisis Situation? Difference between "For Everyone's Sake" and "For the Nation's Sake"
3. What Is National Egoism That Has Appeared in History? Japan's Post-War Lapse into "Peace-Time Stupor"
The Fierce Japan-U.S. "Economic War"
The Sense of Value "As Long As I Have Money, I Will Be Happy"
1. What Is True Prosperity and Happiness? Poverty of the Heart Cannot Be Filled with "Materials"
What Is the "Moral Supremacy of Peace"? 1. What Is a National Ideal That Leads to Motivation in Living? 5. Why Start from Japan? What Kind of Changes Will Arise in Japan and the World? - Now, What Should I Do? The first part of the proposal in this book, which is directed toward the people of Japan, is based on a proposal presented in 1965 in the booklet, "With Everyone, Raise an Ideal for the Country [Minna de Kuni ni Riso o]" by Shigemasa Wada of Hajime-juku school in Odawara City, Kanagawa Prefecture, Japan, after the 1962 Cuban Missile Crisis. The original proposal in this booklet was "Everyone, Let's Raise an Ideal for Japan to be an International Welfare Nation." In 1972, this booklet was supplemented and published by Hakujusha Publishing under the title, "Overcoming National Egoism [Kokka Egoizumu o Koete]". Further, in 1971, Tazue Kobayashi of Saku City in Nagano Prefecture of Japan proposed, "A National Policy to Make Japan a Red Cross Nation." At that time, I was a graduate school student, and was profoundly moved by the noble vision and depth of the insights on human nature of these two men. In the midst of the world situation with the possibility of a full-scale nuclear war between the U.S. and Soviet Union, I felt this was the certain road to save Japan and the world. From that time until now, study groups based on both of their proposals and other movements to spread their ideas have continued steadily among the interested people. For example, one movement was a proposal in 2001 by Professor Ryuji Ito of Toyo University to "Create a Ministry of Peace in Japan." Recently, in countries around the world, there has been increased activity to "Create a Department of Peace." Ito's proposal has been drawing attention as the original proposal of its kind. In the end, however, neither Wada's nor Kobayashi's proposals spread widely. At that time, in the period of rapid economic growth, many Japanese pursued improving their livelihood. Although they understood the threat of nuclear war intellectually, they perhaps felt it was completely separate from them and that they were beyond the reach of such a world. Since then, I had been waiting for an opportunity to present this proposal anew and deepening my research and ideas for many years. I feel that now, the time has come for this proposal to become known widely. This is because a number of conditions have been fulfilled for the Japanese to be able to understand this proposal. First, after the tragic 9-11 incidents in New York and Washington D.C., in the chaos around the world, the detrimental effects of a country's "national egoism" became clear in everyone's eyes. More than anything else, recognition of this is necessary as a prerequisite to understanding the concept of "Overcoming National Egoism" which is the point of this proposal. Second, as the crisis of environmental destruction is being reported virtually every day, we have begun to sense that we have a close connection to the present condition of the world. Without such a sense of the crisis and problems, we cannot understand such a theme as ours: How can we overcome the crisis situation of Japan and the world? Third, right at this moment, the issue of revising the Constitution of Japan has emerged in front of us. This issue will have a great impact on the future of Japan. The great concern regarding our constitution is a very important condition to understand this proposal, which presupposes the extant form of this very constitution. Fourth, people doubting the superiority of economic growth are steadily growing in number, in the uncertain economic future of Japan since the bursting of the bubble. It can be said that this is an ideal situation to enable the people to understand this proposal that presents a new way of being for Japan. At the same time, the essence of this proposal directed toward the people of Japan, that is, moving toward self-initiated renunciation of national egoism, is not something that applies only to Japan. It is universal and can apply to any country, although the situations and conditions may differ depending on the country. With the publication of the English edition, the proposal was newly revised for the global audience but the intent is exactly the same. This book is the culmination of 40 years of my contemplation and actual practice toward "Peace". I am convinced that if there is a way for Japan and the nations of the world to be reborn and for humanity to be saved, then as the fundamental direction, the proposal presented in this book is the most effective path. There may be people who say that this proposal is "not realistic" or "idealistic," but I have described in detail in this book how this proposal is not simply a groundless idea but has a firm foundation based on reality. Now, the ship we are together on board is about to hit a gigantic iceberg. If we think about the generations of our children and grandchildren on whom we have burdened with our debts from extravagance, we will feel that we should turn the rudder right away, even if with a little hardship on our part. Isn't this a "realistic" way of thinking based on facts? There is one more important point I would like to mention. The fundamental resolution to the problems of our countries, and overcoming this crisis faced by humanity depends not on a particular group of people such as politicians or bureaucrats, but depends on the efforts of each one of us. Unless we can change the course of the society as a whole, we absolutely can never surmount this unprecedented crisis. The strength of each of us who compose the society is what will change the course of society. Of all times, now is the time to face directly the crisis of humanity and the critical situation of our countries. By considering "what I should do" the answer will be self-evident. Lastly, an important point is "the way of thinking" proposed here. Please read and re-read, considering not only your self, but ourselves of your family and around you, all of ourselves of our countries and the world, our descendents, and the future of all living beings on earth, without becoming caught by minor things. Further, please let us all deeply contemplate anew, "For what purpose was I born into this world?" I present this book from my heart to everyone in the world who loves peace.